For , we have , a dispersion relation which is like that of an ordinary sound wave, with the pressure provided by the electrons, and the inertia by the ions. However, as the wavelength is reduced towards the Debye length, the frequency levels off and approaches the ion plasma frequency. Let us check our original assumptions. In the long wavelength limit, we see that the wave phase-velocity, , is indeed much less than the electron thermal velocity [by a factor ], but that it is only much greater than the ion thermal velocity if the ion temperature, , is much less than the electron temperature, . 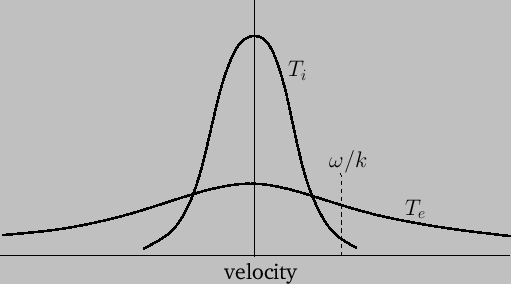 In fact, if then the wave phase-velocity can simultaneously lie on almost flat portions of the ion and electron distribution functions, as shown in Figure 8.7, implying that the wave is subject to very little Landau damping. Indeed, must generally be at least five to ten times greater than before an ion acoustic wave can propagate a distance of a few wavelengths without being strongly damped (Cairns 1985). Of course, it is possible to obtain the ion acoustic wave dispersion relation, , using fluid theory. The kinetic theory used here is an improvement on the fluid theory to the extent that no equation of state is assumed, and also that the former theory makes it clear to us that ion acoustic waves are subject to strong Landau damping (i.e., they cannot be considered normal modes of the plasma) unless . Figure: Ion and electron distribution functions with .